Baby Fiona plays in her enclosure at the Cincinnati Zoo & Botanical Garden. About a year ago, something remarkable happened at the Cincinnati Zoo. A tiny hippopotamus was born six weeks premature at 29 pounds (most baby hippos weigh between 55 and 120 pounds at birth) on Jan. 24. Animal lovers around the world were transfixed by the effort to keep her alive. They craved videos of her first steps and silly antics in the water. 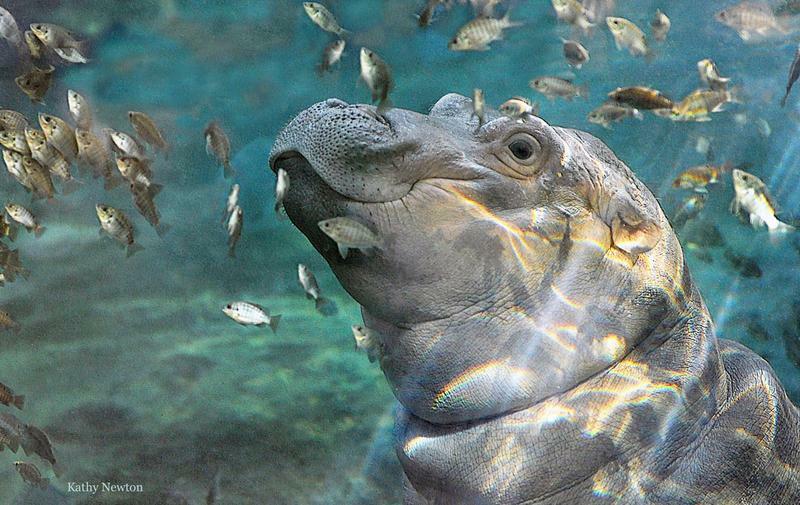 The hippo quickly garnered rock star status, and like Cher or Madonna, she needs only one name: Fiona. On a recent day, the weather in Cincinnati topped 60 degrees. That's important because it must be at least 50 degrees for the zoo's hippopotamuses to be on public display in their outdoor enclosure, Hippo Cove. It's the most popular spot at the zoo. There are parents with young children, adults of all ages and lots of oohing and awing when Fiona floats up to the long, underwater viewing glass and comes nose to nose with fans and cameras. She weighs in at 650 pounds now. Someday she is going to be closer to 3,000 pounds. People say they love her wiggly ears, the distinctive roll of fat around her neck and her playful nature. The Fiona obsession is worldwide. Twenty-seven million people watched The Fiona Show on Facebook. "I think people, often when they come see her, are surprised that we're not hugging on her or kissing on her or something like that ... although she is quite slimy," laughs curator of mammals Christina Gorsuch. She was one of the first people to see and hold the baby hippo. No one had ever hand-reared a premature hippo before so she and the zoo's team had to learn on the fly, even calling on nurses from the vascular access unit at Cincinnati Children's Hospital to start a special IV when Fiona stopped eating. "From a national and global perspective, the amount of love and support and positive outpouring for this little baby hippo has been incredible and, in my mind at least, has given me a little bit of a renewed faith in humanity," Gorsuch says. The zoo got hundreds of letters from children, themselves born premature, telling Fiona: "I made it, and you will, too." Local businesses came out with hippo-branded everything: T-shirts, calendars, ice cream, even beer. And they donated part of the proceeds to the zoo. Overall, the zoo estimates Fiona has generated $2 million to $3 million for the local economy in Cincinnati. The zoo has posted a baby hippo update almost daily since Fiona's birth. Marketing director Chad Yelton says attempts at scaling back were met with resistance. "We've tried a couple times to say, 'If we're bombarding you with Fiona madness, we'll stop,' " Yelton says. "People were like 'You'd better. I'd better get my Fiona fix.' "
The zoo's strategy is to tell Fiona's story as it unfolds, good or bad. It's a tactic the zoo used in May 2016 after a young boy climbed through a barrier and fell into a gorilla enclosure. Keepers shot and killed a 17-year-old western lowland gorilla named Harambe while rescuing the child. Rob Vernon with the Association of Zoos and Aquariums says Cincinnati's tell-all approach is unusual but effective in the world of social media. "I think you will continue to see that openness and transparency become a daily part of what AZA members in particular are doing." He points to Nora the polar bear in Utah as an example but notes that even she hasn't garnered nearly as much attention as Fiona has. Why do people care so much about a hippopotamus? After all, they're highly aggressive and territorial and considered to be one of the world's most dangerous animals to humans. Gorsuch says, for her, it's simple: People love a good story. "We all worked really hard to keep her alive. She worked really hard to stay alive. And then it turned out good," she says. "The end story was really good, which that almost never happens either anymore." "I think beginning to end, she's a feel-good story. She's a feel-good hippo." The zoo is celebrating Fiona's first birthday this weekend with the usual: cake, giveaways and like any child's birthday party, goody bags, which in this case will be treats for the other zoo animals. A Facebook Live event is planned for her actual birthday on Jan. 24. On January 24 of last year, a tiny hippopotamus was born six weeks premature at the Cincinnati Zoo, and she was named Fiona. You might already know that if you were one of the 27 million views that Fiona videos have gotten over the last year. And she's popped up a lot in Facebook and Twitter feeds. People from all over the world have watched as the zoo worked to keep her alive. And now Fiona is about to turn 1. Tana Weingartner of member station WVXU reports. TANA WEINGARTNER, BYLINE: I'm here at Hippo Cove in Cincinnati, and the rock star herself is right in front of me, just a few feet away. She's kind of bobbing in the water right now along this underwater viewing glass in her heated pool. She weighs in at about 650 pounds now. Someday she's going to be closer to 3,000 pounds. And people here are obsessed. CHRISTINA GORSUCH: So I think people often when they come see her are surprised that we're not hugging on her or kissing on her or something like that. Although she is quite slimy. WEINGARTNER: Christina Gorsuch is the zoo's curator of mammals. 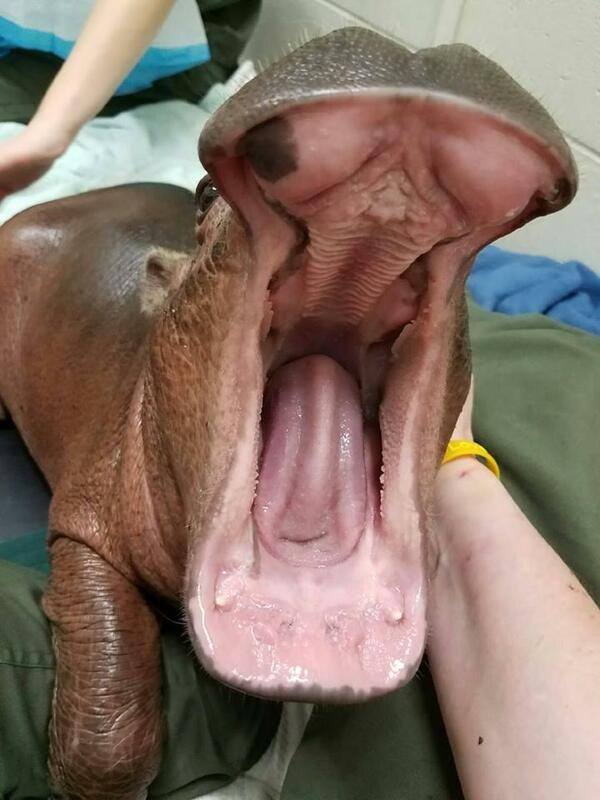 No one had ever hand-reared a premature hippo before, so she and the zoo's team had to learn on the fly, even calling on nurses from Cincinnati Children's Hospital to start a special IV when Fiona stopped eating. Local businesses came out with hippo-branded everything - T-shirts, calendars, ice cream, even beer and donated part of the proceeds to the zoo. Overall, the zoo estimates Fiona has generated $2 to $3 million for the local economy. The zoo has posted a baby hippo update almost daily since Fiona's birth. Marketing director Chad Yelton says attempts at scaling back were met with resistance. CHAD YELTON: We've tried a couple of times to say, if we're bombarding you with Fiona madness, we'll stop. And people were like, you'd better - I better get my Fiona fix. WEINGARTNER: The zoo's strategy is to tell Fiona's story as it unfolds, good or bad. It's a tactic the zoo used in May 2016 after a young boy climbed through a barrier and fell into a gorilla enclosure. Keepers shot and killed a 17-year-old western lowland gorilla named Harambe while rescuing the child. Rob Vernon with the Association of Zoos and Aquariums, or AZA, says Cincinnati's tell-all approach is unusual but effective in the world of social media. ROB VERNON: I think you will continue to see that openness and transparency become a daily part of what AZA members in particular are doing. WEINGARTNER: He points to Nora, the polar bear in Utah but says even she hasn't garnered near as much attention as Fiona the hippo. So why do people care so much about a hippopotamus? After all, they're highly aggressive and considered to be one of the world's most dangerous animals to humans. Zookeeper Christina Gorsuch such says for her, it's simple. People love a good story. GORSUCH: We all worked really hard to keep her alive. She worked really hard to stay alive. And then it turned out good. Like, the end story was really good, which that almost (laughter) never happens either anymore. So I think beginning to end, she's a feel-good story. She's a feel-good hippo. 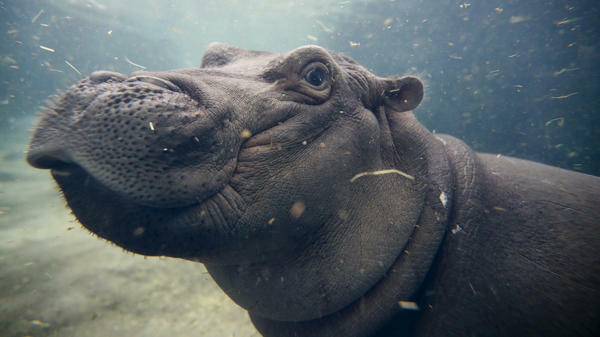 WEINGARTNER: The zoo is celebrating Fiona's first birthday this weekend with the usual - cake, giveaways and, like any child's birthday party, goody bags, which in this case will be treats for the other zoo animals. For NPR News, I'm Tana Weingartner in Cincinnati. A month-old hippo born premature is clear to return to her pool. The Cincinnati Zoo says Fiona's IV has been removed and "vets have given her the okay to resume supervised pool time."